With technology advancing so quickly, it isn’t very difficult to expect the most out of gaming in the future. In just the last couple of decades, gaming has grown by leaps and bounds. Beginning from regular old 2D games to the video games of today that are hard to distinguish from reality, we have come a long way, and the journey is far from over. This is where VR devices like Project Morpheus and the Oculus Rift come into the picture! These devices offer a premium experience to users by letting them interact with the virtual world in a new way. You can experience shooting, walking, flying, and so on, like never before. Apart from virtual reality, there are also devices like Leap Motion that work on gestures. They let you enjoy video games with nothing more than hand gestures. This lets video games create a rich experience for gamers. If you go back just a few years, it would seem unbelievable that we are talking about virtual worlds where players can interact with each other. 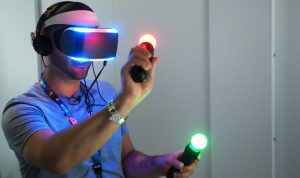 The only question on everyone’s minds right now is will VR be able to live up to the hype? As online gaming keeps getting more and more popular, and advancements like augmented reality get added into the mix, the perfect virtual world starts looking more achievable every single day. Just think of a device like Google Glass. It blurs the line between what is real and what is virtual. This is something that will take a little getting used to, but it is also proof that the possibilities are endless. It goes without saying that expectations are high, and we can’t wait to see what the future holds. Imagine the possibilities when you have a virtual world where the sky is literally the limit!